Rejoice, Friends enthusiasts! 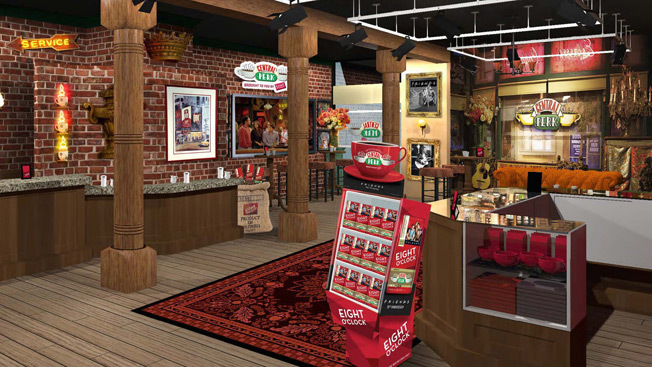 Your dream of sipping coffee at the iconic Central Perk will soon become a reality. It's been 20 years since Ross, Phoebe, Monica, Joey, Chandler and Rachel first graced our TV screens, and the love for the gang remains strong, if all of the people on my Facebook feed are to be trusted. To celebrate two decades of shouting "Pivot!" every time a friend announces he's moving, Warner Bros. Television Group, Warner Bros. Consumer Products and Eight O'Clock Coffee are partnering to create a Central Perk pop-up in New York. It'll be short-lived—the shop, created with help from agency Source Marketing, will open Sept. 17 at the corner of Lafayette and Broome Streets, and close Oct. 18—but fans can hang out on the weird orange couch, listen to a rendition of Smelly Cat, see some special guests (Gunther will be there) and maybe, I don't know, try to figure out how Rachel afforded to live in a sprawling Manhattan apartment on a barista's salary. It's a brilliant partnership for Eight O'Clock, which will also be adding a special Central Perk blend to its coffee line next month, if you want to K-Cup your way to a Friends-in-your-travel-mug experience. UPDATE: Turns out, it will only be available in bags, not as K-Cups. So maybe you could just brew a pot for all your—Wait for it! Wait for it!—friends.